Within that notebook I have saved all of my assignment details and due dates, subject readings and study materials. However if this was all just in the notebook I would have to search through it to find what I want- at this stage tagging would probably come in handy for some people…but I am not good at tagging- rarely (if ever) remembering to do so. Instead I use the reminders feature to pin certain notes to the top of my view. 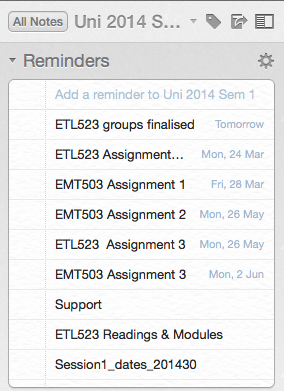 As you can see, I have added a date to some of the reminders so I know when that particular piece of work is due. Once selected, it will look a little something like the image below. 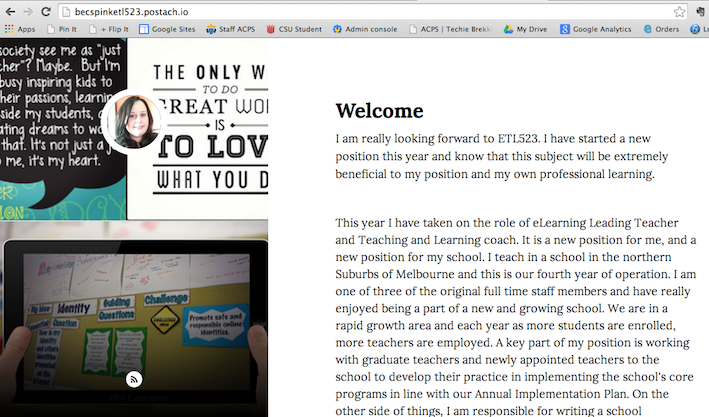 I then changed the note title and added a reminder so it would appear for easy access at the top of my screen. If I save anything else to the notebook, I can add to the list above by right-clicking on the note and selecting ‘copy note link’, then I can paste to the next line in the bulleted number list. Another favourite Evernote feature of mine is the web clipper. I use the web clipper for Chrome and love all of the features. 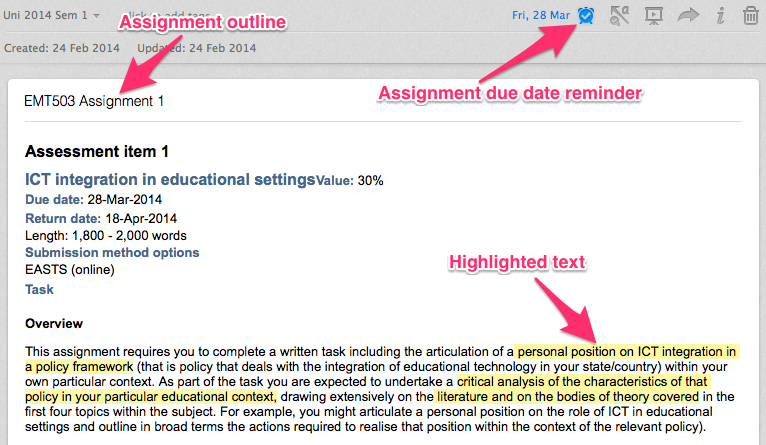 Another great feature of Evernote which many people probably already know about is the text highlighting. I use this often for identifying key information in an assignment outline and highlighting important parts of module readings. Another layer of information going into this notebook is a daily digest of communication from one of the subject blogs. To do this I used IFTTT. There were two reasons why I chose to do this. One, I did not want to miss out on conversations and discussions about assignments or module readings and sometimes I don’t have time to go in and check the site everyday and two, I didn’t want instant emails sent to me and just have them sitting there in my inbox with me not reading them. Using IFTTT has allowed me one place to access all the conversations that have happened throughout the day, right from my Evernote account. These emails are automatically added to my Uni notebook. I have found this to be a great way to keep me organised…even though I still struggle to find time, I know that once I have it I can get down to work straight away. 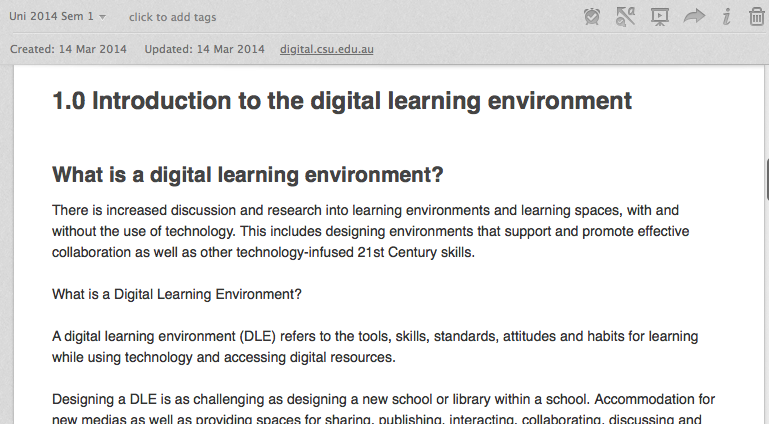 As well as this organisation, for both of my subjects I need to keep a reflective blog. In order to do this I am using Postach.io. For each blog, I have created a notebook (in reflecting on this, I could have just had one Posach.io site and added both blogs, but I did not think of this until I had already created them). 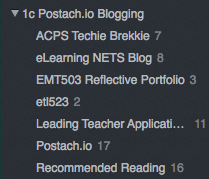 Blogging with Postach.io is incredibly easy, and if you are like me and everything you do is already in Evernote it saves time too. Once you set up your Postach.io account and have set up a blog, all you do is write your blog post in Evernote and tag it with ‘published’, once your account has sync’d your post appears online. With such a busy schedule it is so important that I organise myself in an effective way. I don’t want to be stressing about when and how to do things, I want everything I need at the tip of my fingers, decluttered and organised. Evernote gives me this and so much more. 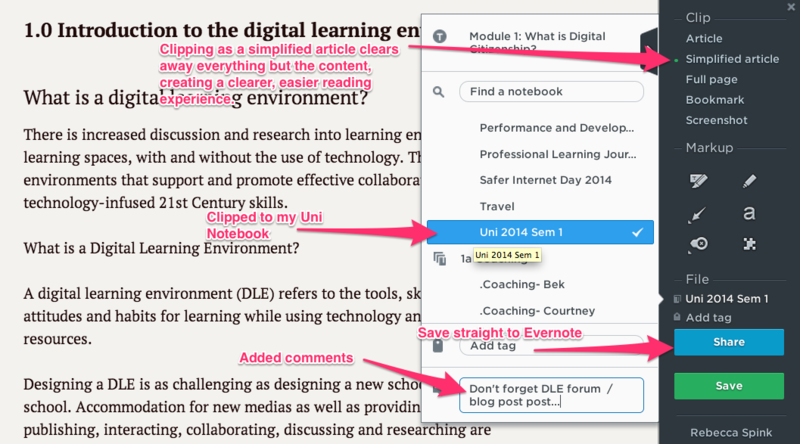 How do you use Evernote for study?